Bijay Gachhedar, the Corrupt Home Minister, Kicks out a Competent Home Secretary from the Ministry | United We Blog! The bad news is that despite Prime Minister Baburam Bhattarai’s own assurances that the government secretaries would not be transferred within the first month of his entering Baluwatar just to appease any individual or group, the cabinet meeting on Friday (yesterday) transferred Home Secretary Leela Mani Paudyal, describing it as an ‘exceptional step’ to address deepening misunderstanding between minister and secretary. A cabinet source told Republica newspaper that the cabinet took the decision upon a “special request” by Deputy Prime Minister and Home Minister Bijaya Kumar Gachchhadar. “Since the home minister has said repeatedly that he has not been on the same wavelength as Home Secretary Paudyal, I have been compelled to take the decision, though it goes against my own words. This decision should be taken as an exception,” a source quoted the prime minister as saying in the cabinet. A second source informed that Deputy Prime Minister and Minister for Foreign Affairs Narayankaji Shrestha, who had worked with Paudyal when he was home minister in the previous government, objected to the transfer, saying, “The decision to transfer one of the best secretaries would make a mockery of the government´s commitment to good governance”. Many had predicted Paudyal’s transfer the moment Gachchhadar was appointed home minister as Gachchhadar’s past record would not resonate with Paudyal, who has demonstrated an impressive record in terms of good governance. Other sources close to Gachchhadar and Paudyal told Republica that the home minister was not happy with Paudyal over his policy of promoting good governance at the police administration and home ministry and his unshakable stance against those breaking the law under the aegis of the political parties. Sources close to recent developments at the Home Ministry point out that the following reasons at least might have instigated Home Minister Gachchhadar to get Paudyal transferred. First, Paudyal had resisted political pressure with regard to the arrest of Kausar Ali Musalman, who faces criminal charges in Butwal, in the first week of September. The home minister himself had called the police in Kapilvastu to release Musalman, but Paudyal directed the police not to release him. Second, Gachchhadar was also not happy with the arrest of businessman BL Sharma, owner of Anmol Sweets, who is now under arrest for selling substandard sweets. Gachchhadar wanted not to arrest Sharma, citing the latter´s age. Sharma is 88 and has been under “treatment” at Norvic Hospital from the day he was arrested. But Paudyal was in favor of arresting Sharma at all cost and the arrest took place under his direction. Thirdly, Gachchhadar wanted to loosen the screws against the smuggling of red sandalwood in which Ganesh Lama, a don long protected by the home minister, is involved, said a source close to Paudyal. But Paudyal refused to budge over the matter. Fourthly, Gachchhadar had recently expressed displeasure with Paudyal over the raids at casinos at Everest and Hyatt hotels. Paudyal had directed the raid as the casinos have not paid royalty to the government. Fifth, Gachchhadar wanted to loosen the screws against smuggling in the Tarai districts but the secretary had warned police officers in the Tarai that they would be punishment if they allowed smuggling. Similarly, the ministry is making preparations to promote and transfer senior police officers. The secretary had prepared certain procedures for deciding on police promotions and transfers. But Gachchhadar wanted to handle the promotions and transfers at his own discretion. Home Ministry sources said that promotions and transfers in the Nepal police generally involve money changing hands. Lately, the police in Boudha had arrested a don protected by Gachchhadar. The home minister also knew that the police were after another don protected by Gachchhadar in a Tarai district, another source close to the home minister told Republica. Last but the not least, certain diplomatic missions in Nepal were not happy with Paudyal for strictly prohibiting police officers from meeting officials from any international mission. The source said that they had exerted pressure on Gachchhadar to transfer him. In addition, he had made it mandatory for either a joint secretary or an under-secretary to be present when the home minister meets officials from foreign missions. A couple of foreign embassies, while seeking his removal, had accused him of being close to China. Paudyal has now been posted at the Office of Prime Minister and Council of Ministers while Secretary at that office, Sushil Jung Bahadur Rana, has been named Paudyal´s successor. And the Kathmandu Post, in an editorial piece today, asks the PM to reconsider his decision go to New York to attend a UN meet. On Monday, Prime Minister Bhattarai is flying over two continents and two oceans, economy class, to attend the UN General Assembly. Unlike the last prime minister to visit New York, whose reception in the Nepali community in New York was less than welcome, Bhattarai will land with all the glamour and confident aura bestowed on a popular politician. But is the trip worth making with the disarray at home? Intellectual that he is, Bhattarai has noted the role of external actors in internal politics, pointedly apparent during the transitional stage, and promised to focus on discussions with Nepal’s immediate neighbours and a few geographically distant global powers — presumably the UK and the US. Also, the Ministry of Foreign Affairs and the newly-appointed foreign minister, Narayan Kaji Shrestha, are busy at work to prepare the briefs for side-meetings at the UN, so as to make the trip a success. These rationales give a measure of utility to a less than urgent a trip when you consider the outstanding issues at home. Bhattarai has garnered heavy praise from the media and public for decisions taken during the first two weeks of his premiership. First was his decision to make the Nepal-made Mustang — named after a northern district but assembled from imported parts — his official vehicle. He has recently announced a relief package for the general public that will no doubt face verbal assaults from the opposition in the parliament. Related to the coming trip, we applaud his decision to fly economy class, a highly symbolic move from a Marxist who believes in obliterating class boundaries. His critics have labeled his decisions ‘cosmetic’ and ‘populist stunts’. But the fact is also that power politics in Nepal revolves around the prime minister’s chair. Bhattarai’s departure will further reduce the momentum the peace process gained with his election. After New York, there is also New Delhi on the agenda. There is a growing perception that the Indian government wants to cooperate with, not marginalise, the Maoist-led government. A trip to Beijing will follow soon after — a must, given Nepal’s need to balance the two powers. But unless these trips are highly focused and brief, they risk further slowing down the peace process. And with it, further deferring the dreams of peace and constitution. Bhattarai has declared that he will give up his post the minute he can’t work for ‘the country and the people’. But the minutes that he does have, we suggest, are best spent attacking the knots in Nepal’s tangled peace process. Leaving for trips overseas now is more likely to distract him from his core agenda: peace and constitution. We certainly expect Bhattarai, with his keen sense of history, to set his priorities right before it’s too late for both him and the country. Previous Postनेपालमा जारी विचारको गुरिल्ला युद्धNext PostForeigner’s Eye: I Married a Nepali Mountain Biker! tyo mulako sag gachhadarle etro aant garyo? Hunata tyo bhrastacharilai grihamantri banaune maobadi ani baburam sab lai ek choti yo kurako barema clearification linuparchha. All Nepali Politicians are corrupted. Some of them are Smugglers, some are Murderers, some are Robbers, some are Rapists and so on. So, how do you think that Nepal can have a good Governvent? If we look at the history of all 601 Nepali PARASITES, none of them is CLEAN. The fate of Nepali people is like that because we follow these TRAITORS with Nationalistic Slogans. The Nepali Journalists, who can bring out the real face of parasites, themselves follow them. What can we expect from them(Journalists)? A journalist must be independent but in Nepal it’s not. 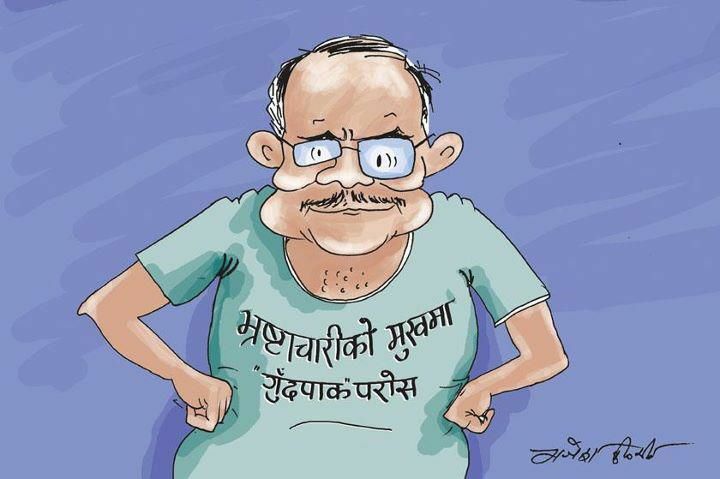 Mr. Baburam is a Murderer and so is Gachhadar. So it is not a big thing for Baburam to transfer the Secretary. The only way to save Nepal is TO GET RID OF ALL SUCH POLITICIANS FROM NEPAL’S SOIL. Thank and appreciation goes to Nepali Dai for his realistic comment.Indeed,Nepal needs to get rid of criminal politicians who are capturing the country in the name of so called new Nepal.Nepal’s identity is in great threat under initiate process of new Nepal.The case of Sudan deviding into north and south separate country most likely be the case of Nepal as well and for preventing the same current alliance with Madhesi must be defunct at its earliest.